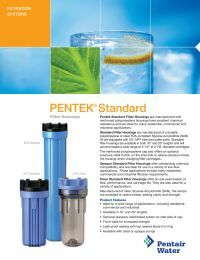 Pentek Standard Water Filter Housings are made of durable reinforced polypropylene cap and a styrene acrylonitrile (SAN) sump and come equipped with 3/4" NPT inlet and outlet ports. The housings offer flow, performance and cartridge life and accommodate a wide range of 2-1/2" to 2-7/8" diameter cartridges making them ideal for use in a variety of low-flow applications. The clear sumps are annealed to relieve stress and to add clarity and strength. Note: Clear Housing Sumps are more prone to leaking and cracking, and are not as resilient as their opaque counterparts. They may be significantly less able to handle high pressure, temperature, exposure to sunlight, and other stress. We highly recommend considering a black, blue, white, or grey opaque housing sump, especially if your system is operating under high pressure or temperature conditions. Fresh Water Systems offers heavy duty polypropylene filter housings in a variety of sizes and colors.